Lunous is a brand new 65 foot super-yacht launched in 2018 to offer luxury sailing holidays in the Greek Islands. 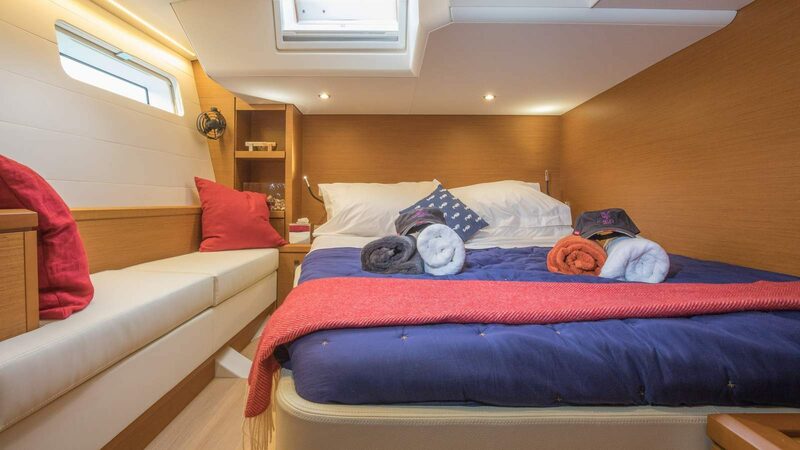 She comes with a skipper and chef to ensure you get the most out of your stay and has a speed-boat with all the “toys” to keep everyone entertained. 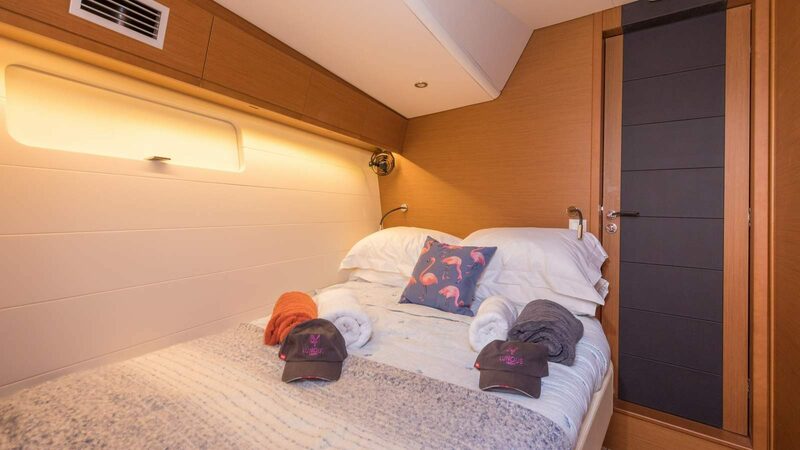 There are 4 ensuite double cabins for up to 8 guests (plus kids bunks if required) and a big open plan deck with plenty of space for sunbathing and relaxing. 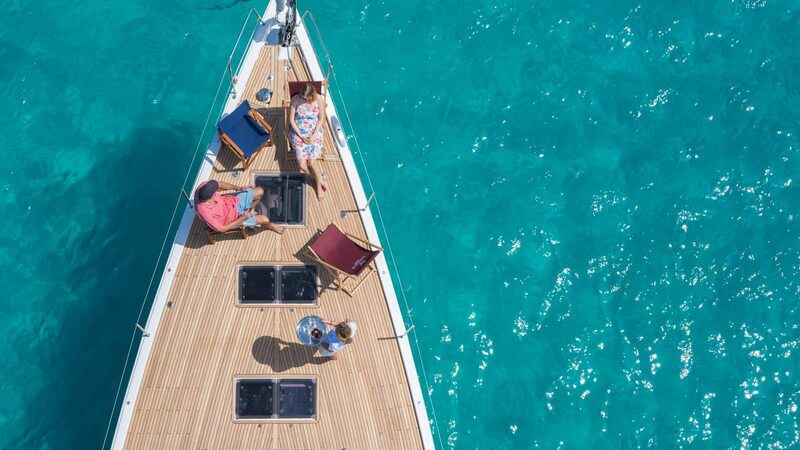 By having only two levels to the deck moving around is simple and there is easy access to the bathing platform for swimming and watersports. For 2018 she will start in the Ionian Islands and then move to an Athens base to explore the Saronic Islands (Spetses, Idra, Poros) and the Cyclades (Mykonos, Paros, Naxos). 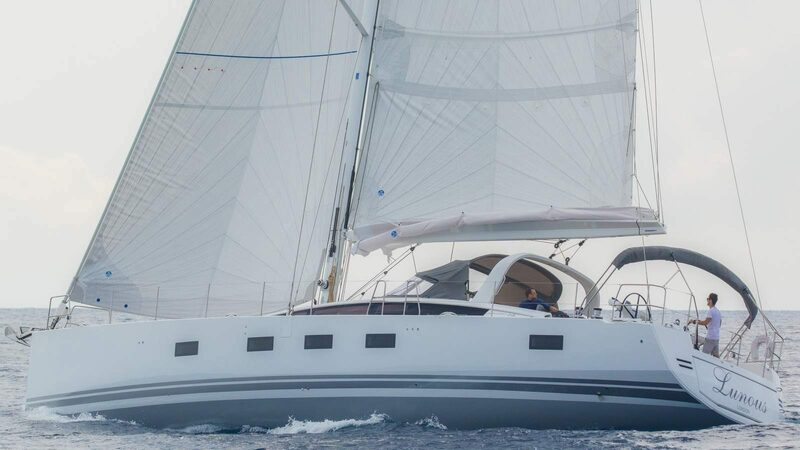 As well as being a luxurious “floating villa”, Lunous is a high performance sailing yacht with a powerful sail-plan – there is a fully battened mainsail and code zero spinnaker for the lighter winds. 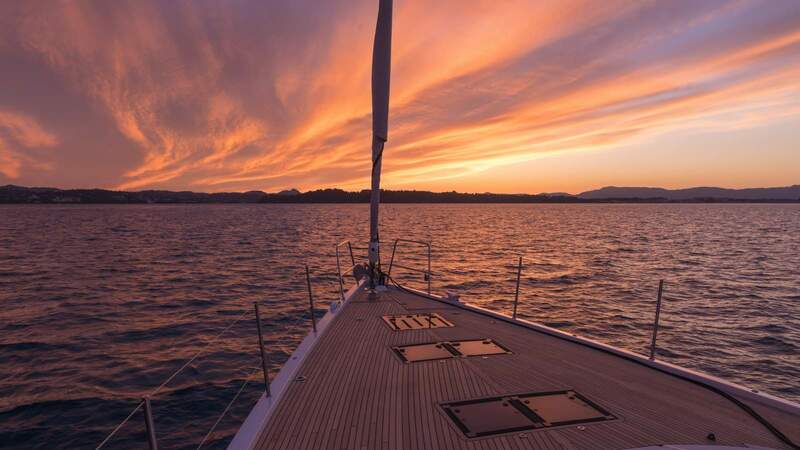 She will get moving as soon as the breeze comes up and eat up the miles between the islands so you can see as much as possible during your time on-board. 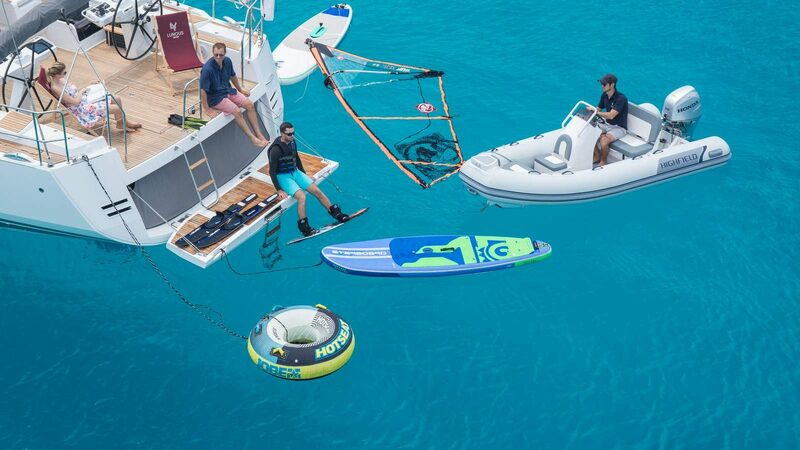 And in the garage, there is plenty to to play with: two SUP’s, ringo and towing mattress, waterskis and wakeboard and windsurfer rig. Use the “drop down” arrow to see detailed information images about the different aspects of Lunous. 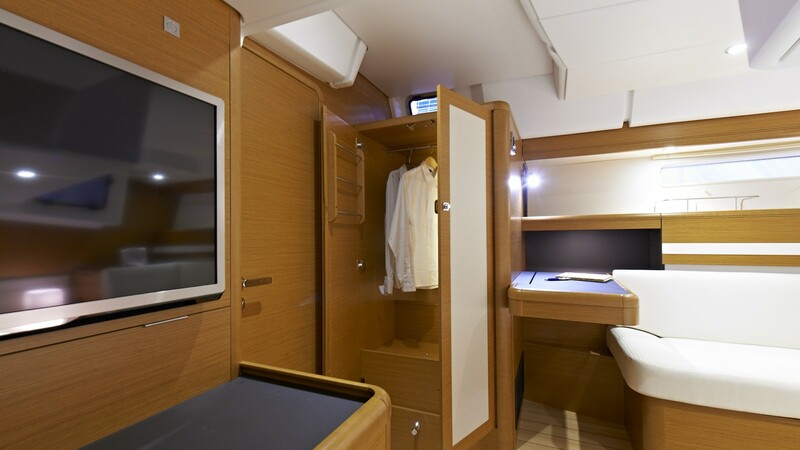 Whether it is the sleeping arrangements or the catering, or the technical sailing info, it should all be here. Each section has accompanying photos but of course, if there is anything you want to know just email or call us. 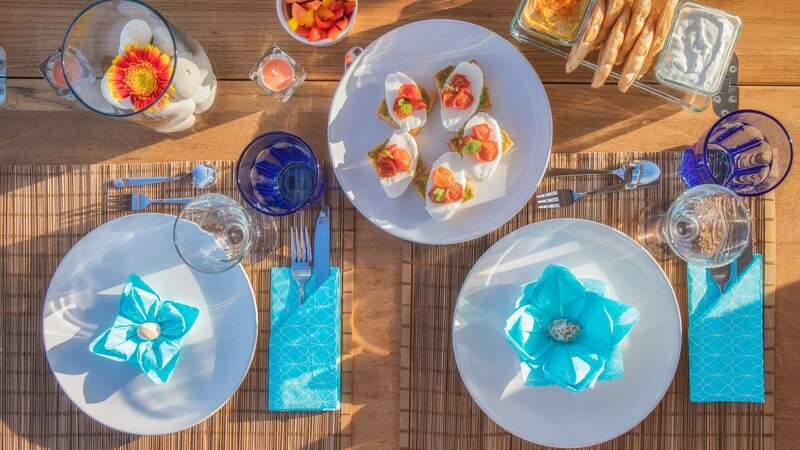 Breakfast, a light lunch, all soft drinks, tea/coffee, water and snacks are all included. The only extras are dinner (from £20 for adults, £15 for children) and alcoholic drinks. On booking you will be sent a request form for your preferences. Part of the fun of having a private chef is choosing the menu daily. 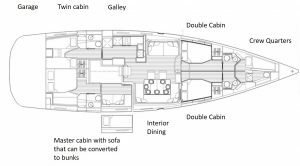 In additional there is twin cabin aft of the main saloon and two identical double cabins forward of the lounge and dining area. 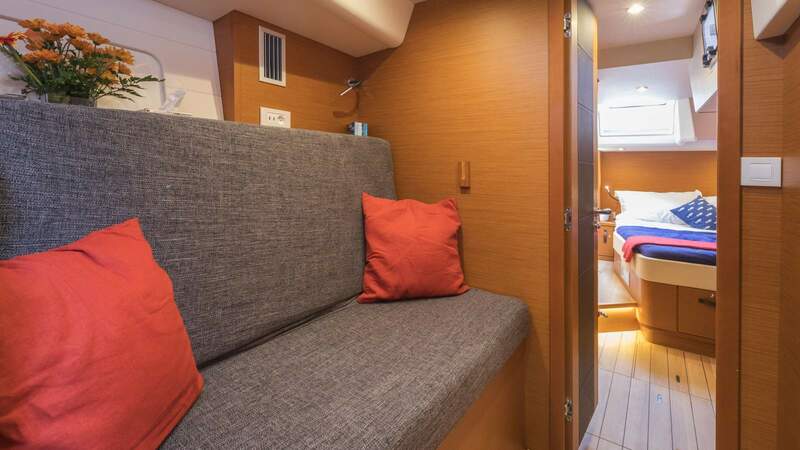 All cabins have a private shower room with electric toilet (no back-wrenching pump loos) and the cabins and the living areas have individually controlled air-conditioning. 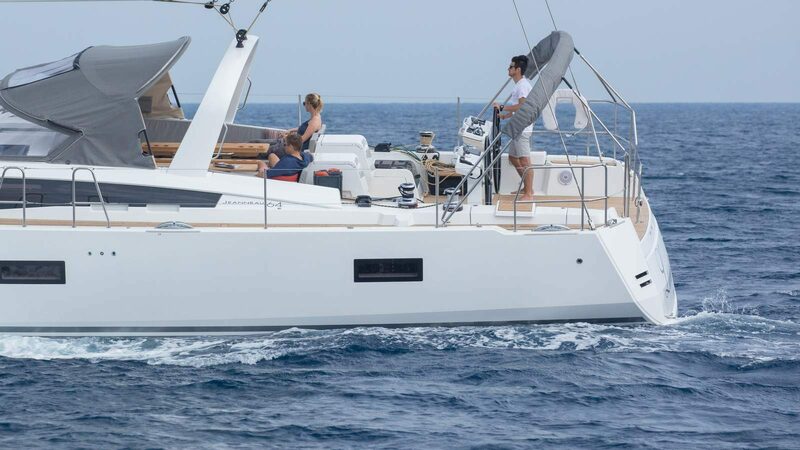 Lunous comes with a 30 knot 4 metre rib which is great for ferrying people ashore. 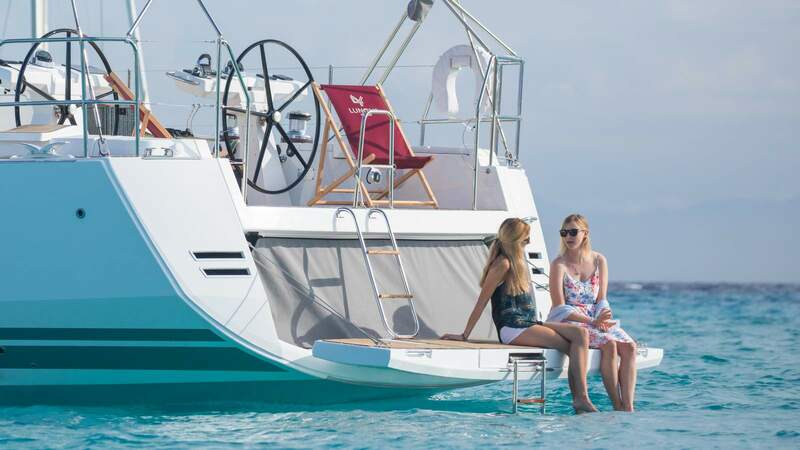 But it is not just a workhorse and can be used as a ski boat for waterskiing, wakeboarding and towing inflatable toys like ringos and banana boats. 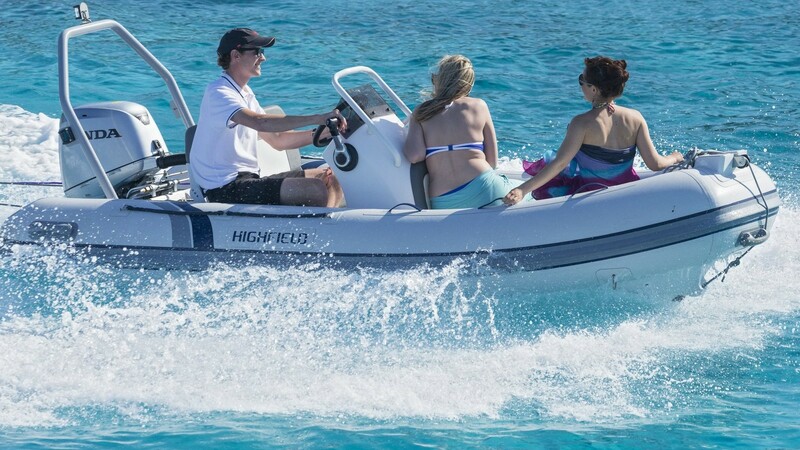 However safety is paramount with such a powerful craft and high speed activities are only allowed under qualified supervision. Sailing isn’t the only wind powered activity on Lunous. She has 2 “SUP’s” (stand-up paddle boards) for exploring the coastline and having some light excercise. SUP has really exploded as a sport in the last couple of years and the ease and freedom it gives you is the main reason. 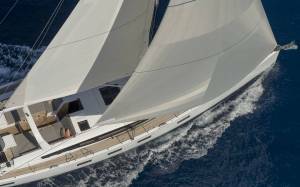 As well as a luxury cruiser, Lunous is a high performance sailing yacht with an emphasis on ease of handling. 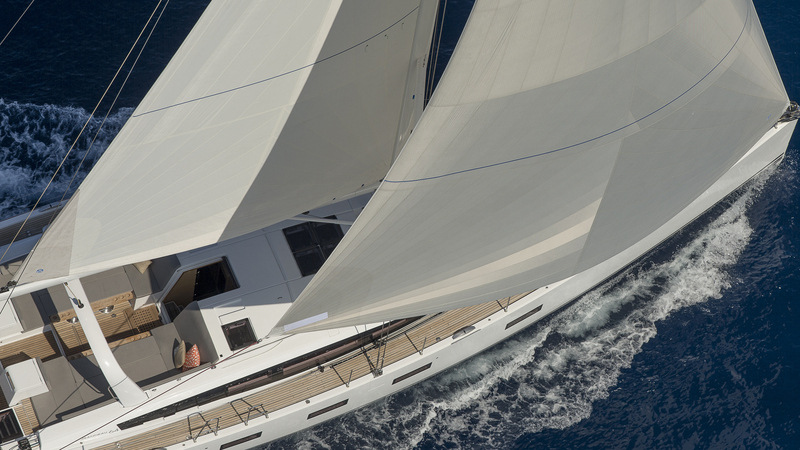 All the sails are electrically controlled so she can be easily sailed by two people. The main power unit is a Volvo Penta 18hp engine and cruising speed is 7 knots or 8 knots. We allow for 3 hours under motor each day so up to 150 miles in a week which is plenty even if the wind gods aren’t behaving. In total there is over 800 litres of fuel on board giving a range of around 600 miles. 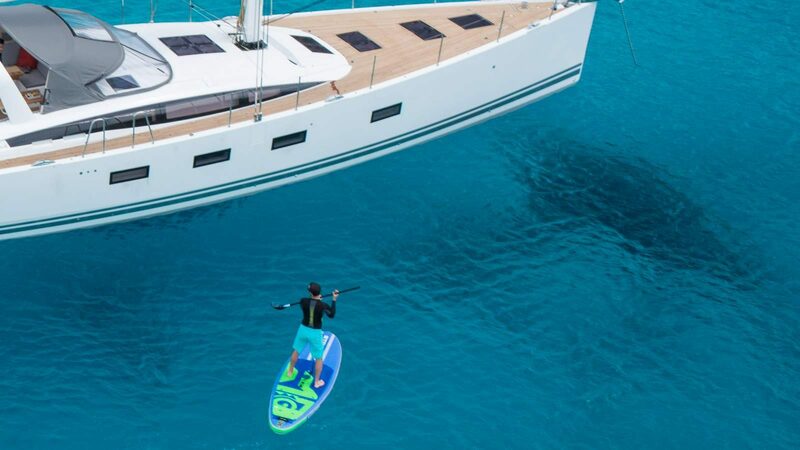 Lunous is a large yacht and the use of space makes her seem even bigger. 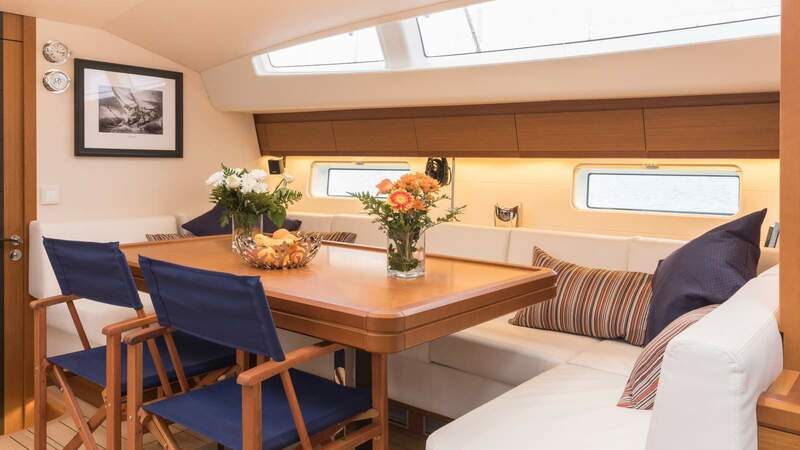 The main cockpit has both a lounging area and a seating area around the large table. There are deckchairs on the rear deck for watching the water slip away behind you. 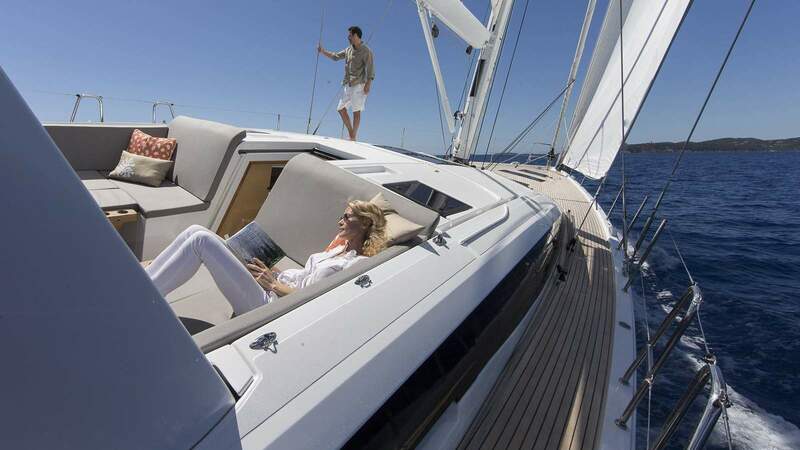 In addition there is a large sunbed and hammock for the foredeck when moored. 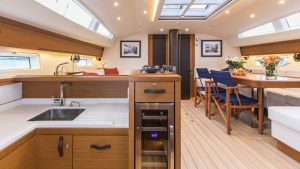 Also, the garage door folds down to make a teak bathing platform. All of the sails electrically furl and the winches are all electric (2 with rewind). Use the "drop down" arrow to see detailed information images about the different aspects of Lunous. 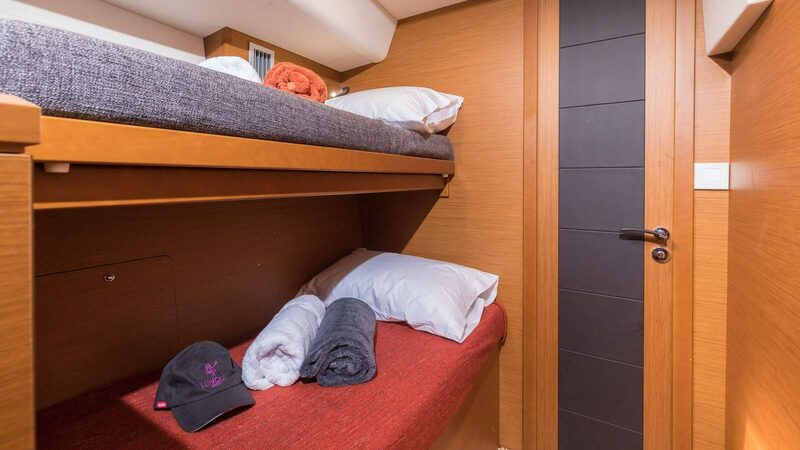 Whether it is the sleeping arrangements or the catering, or the technical sailing info, it should all be here. Each section has accompanying photos but of course, if there is anything you want to know just email or call us. The rear master cabin has awith king-sized bed and sofa and also a private ante-room with a sofa that converts into child-sized bunks. 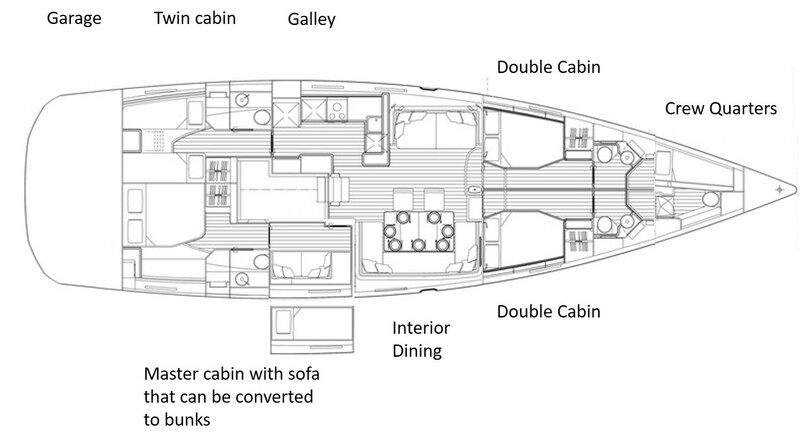 There is also twin cabin aft and two identical double-bedded cabins forward of the lounge/dining area. 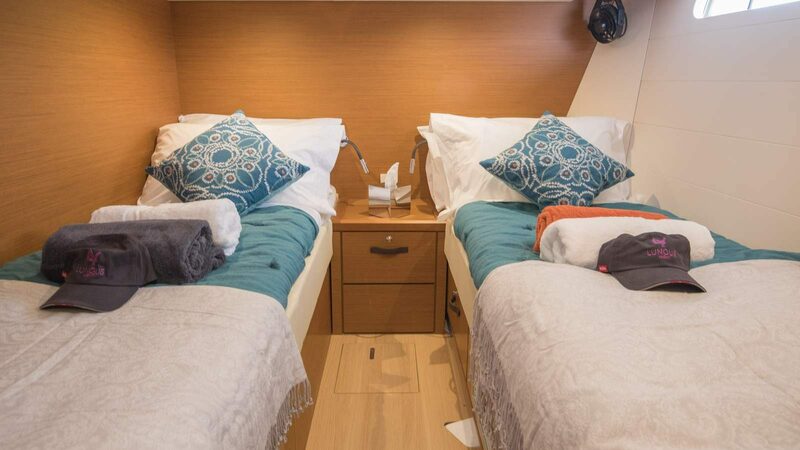 The crew have separate quarters in the bows accessed by a deck hatch. 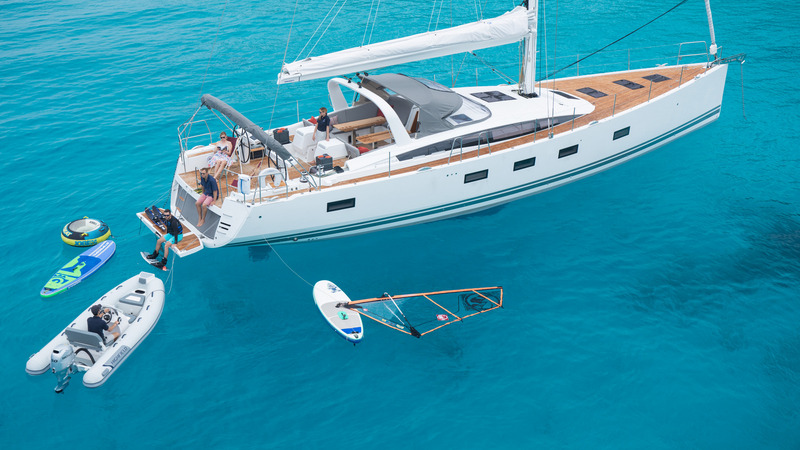 Lunous comes with a 30 knot 4m rib which is great for ferrying people ashore. 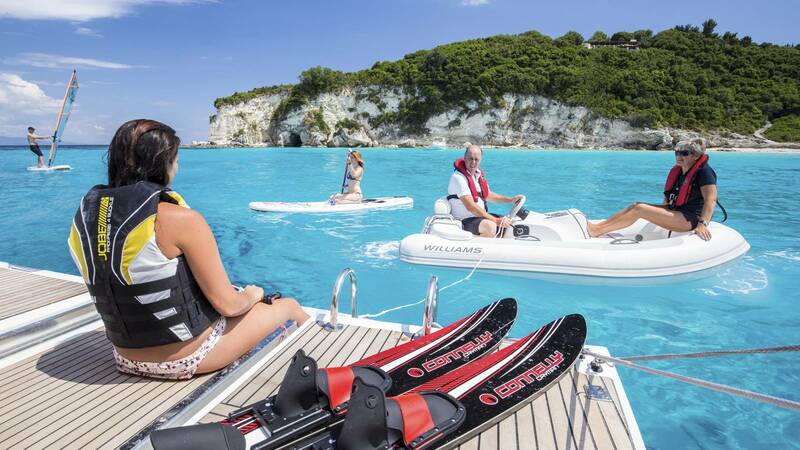 But it is not just a workhorse and can be used as a ski boat for waterskiing, wakeboarding and towing inflatable toys like ringos and banana boats. 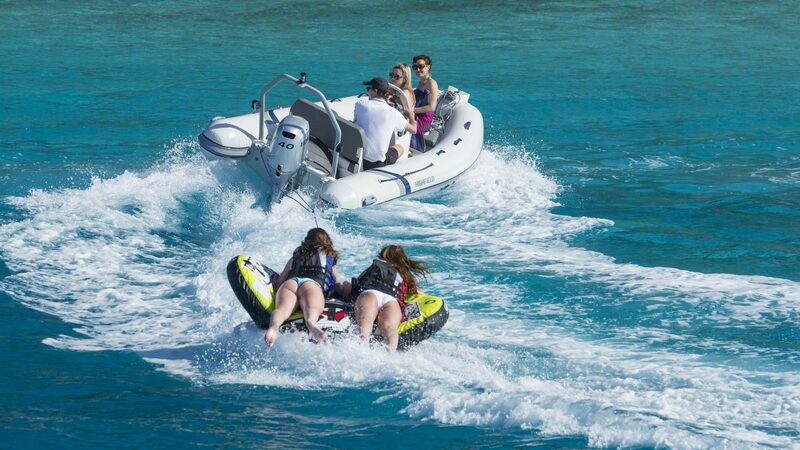 However safety is paramount with such a powerful craft and high speed activities are only allowed under qualified supervision. Sailing isn't the only wind powered activity on Lunous. She has 2 "SUP's" (stand-up paddle boards) for exploring the coastline and having some light excercise. 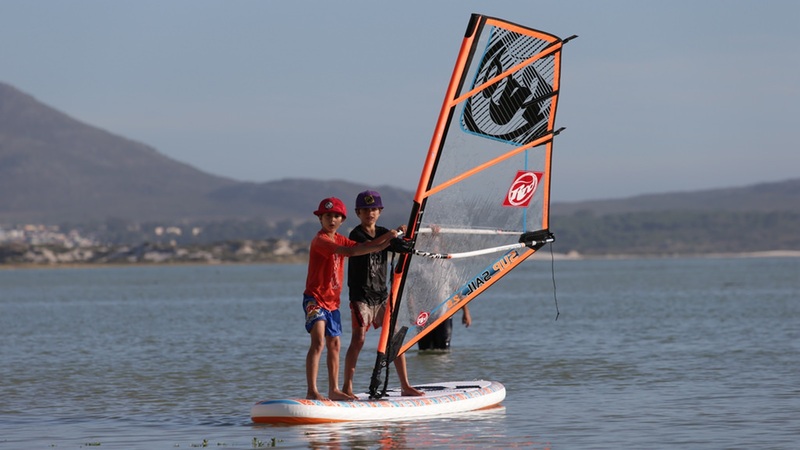 SUP has really exploded as a sport in the last couple of years and the ease and freedom it gives you is the main reason. 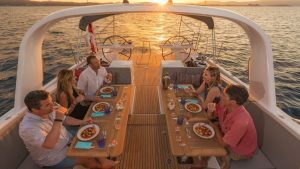 The main power unit is a Volvo Penta 180hp engine and cruising speed is 7 knots or 8 knots. We allow for 3 hours under motor each day so up to 150 miles in a week which is plenty even if the wind gods aren't behaving. In total there is over 700 litres of fuel on board giving a range of around 600 miles. Lunous is a large yacht and the use of space makes her seem even bigger. 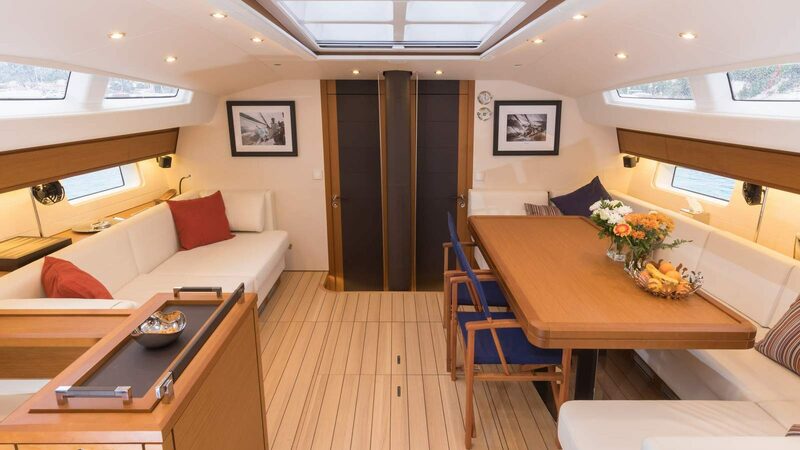 The main cockpit has both a lounging area and a seating area around the large table. 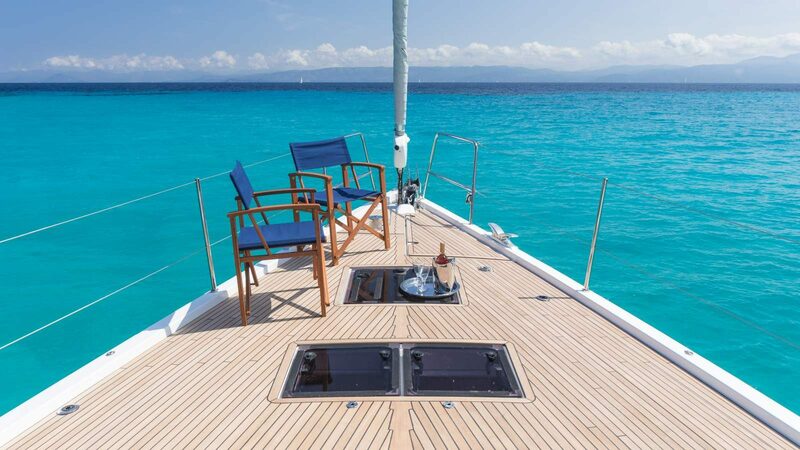 In addition there are deckchairs aft of the wheels to watch the water slipping away behind you and sunbed and hammock for the foredeck when moored. Also, the garage door folds down to make a teak bathing platform. All of the winches are all electric (2 with rewind). 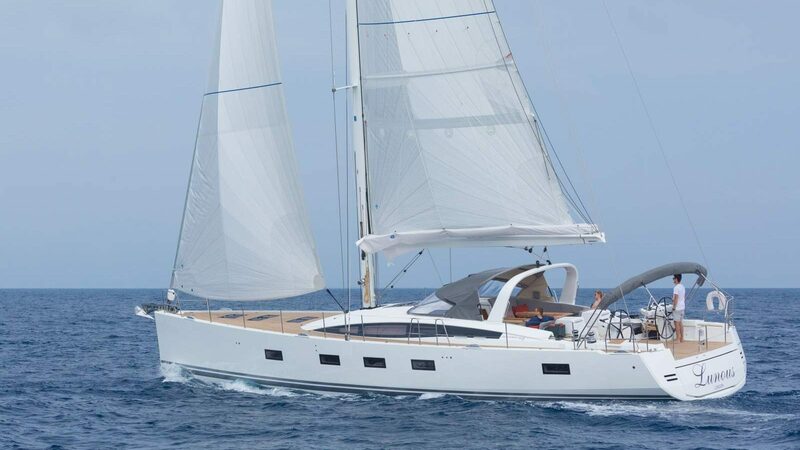 The base for Lunous for summer 2018 is starting int he Ionian Islands and then heading down tot he Saronics and Cyclades. 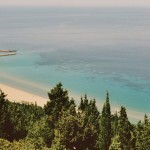 The Greek Ionian Sea is one of the most beautiful sailing arenas in the world. 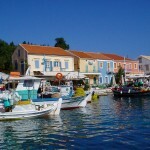 Little tide or current, reliable weather, wonderful locals and of course fabulous tavernas for eating out. 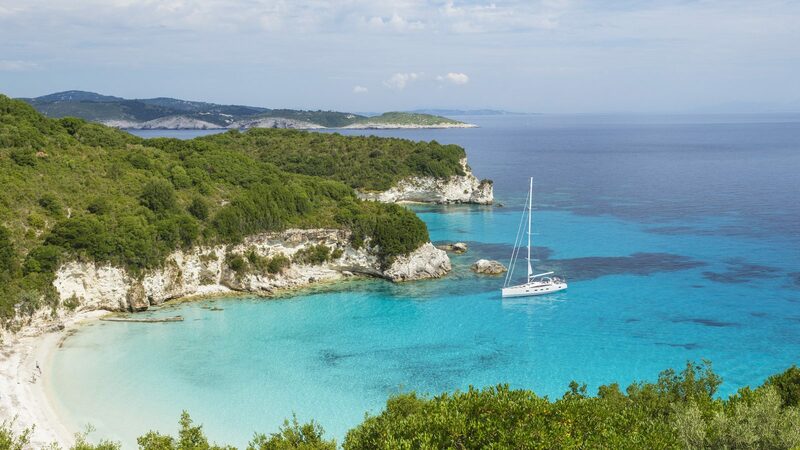 Lunous' base is Corfu or Athens for the flights and there are lots of cruising options. 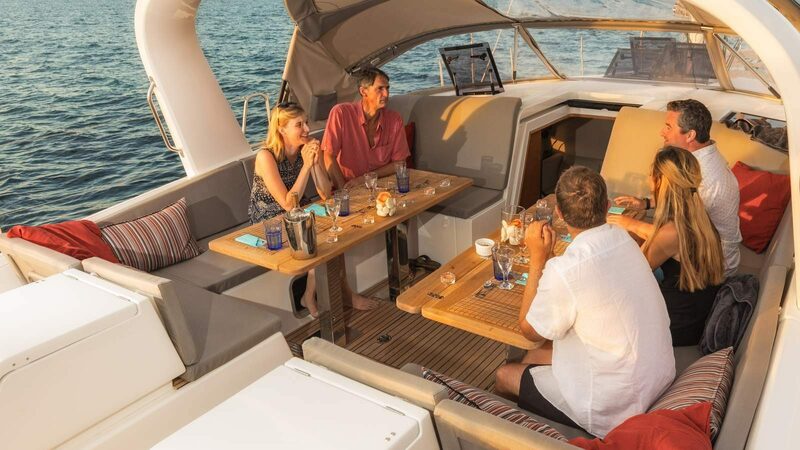 The idea of super-yacht holidays was a collaboration between Alisdair Luxmoore of the tour operator “Fleewinter” and Barrie Neilson from the flotilla company “Sailing Holidays”. 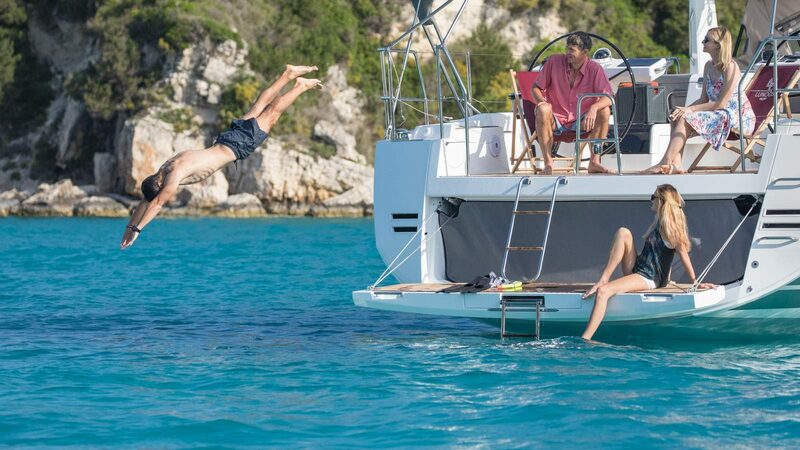 With a few decades of providing holidays both on land and on the water between them and a love of sailing they believed that more people could be persuaded to take to the water if there was no compromise on comfort and little or no sailing experience was needed. 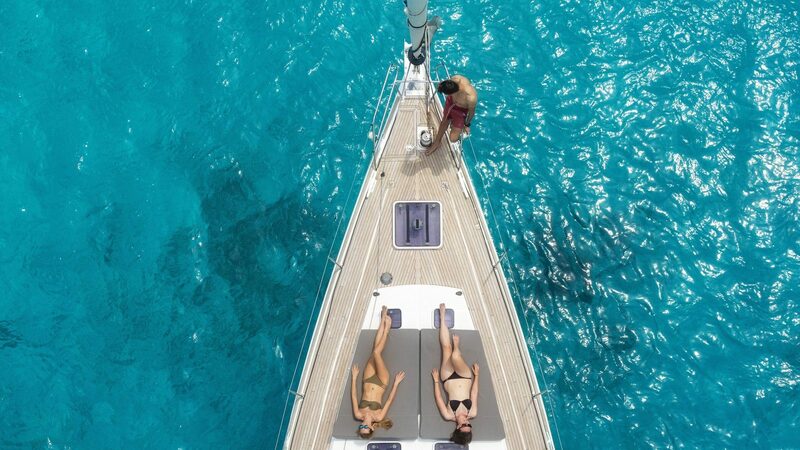 People are wanting more from their holidays nowadays than a simple stay on a beach and the idea of a yacht with the facilities of a luxury villa was born. 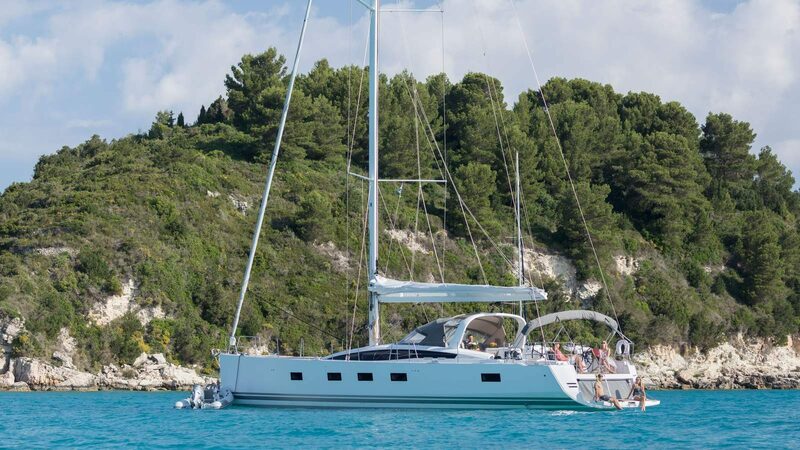 Finding a boat that ticked all the “super-yacht” boxes yet meant we could keep prices affordable was a challenge, The first yacht was Argentous in 2015 and she was joined by Jeannous and the luxury catamaran Aurous – all beautiful boats with a raft of special features and superb comfort. But don’t take our word for it, come and see for yourself! 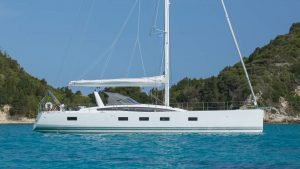 No reviews yet – be the first to sail on Lunous! 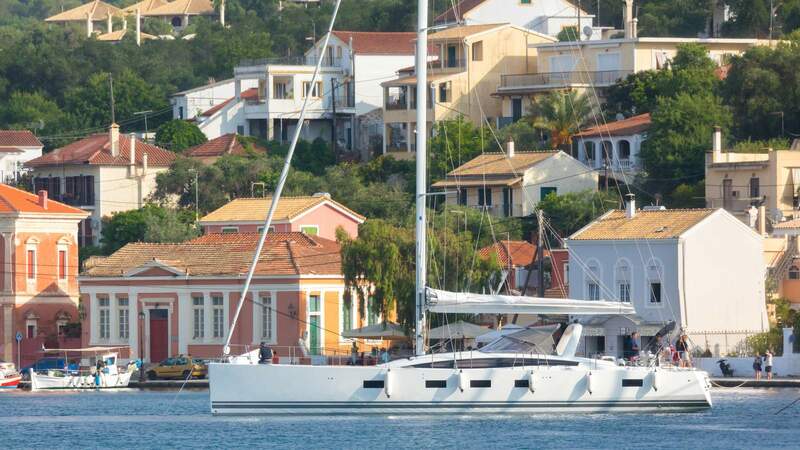 Lunous launched in May 2018 and is now in the Greek Islands. For news and updates watch her facebook page. 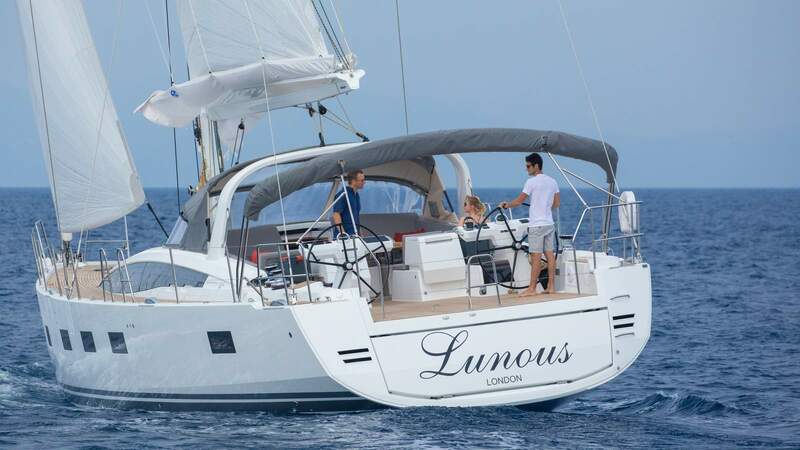 Lunous is owned by Super Yacht Holidays Ltd, A UK company with registration number 9286021. The company was formed by Alisdair Luxmoore, the founder of the tour operator Fleewinter Ltd and has a number of private shareholders. We hope we can expand the fleet to have yachts dotted all over some of the most beautiful parts of our planet, thereby introducing the pleasure of sailing to people who would not normally think of themselves as “yachties” For more information please contact Alisdair or Anna on the phone or using the contact form. 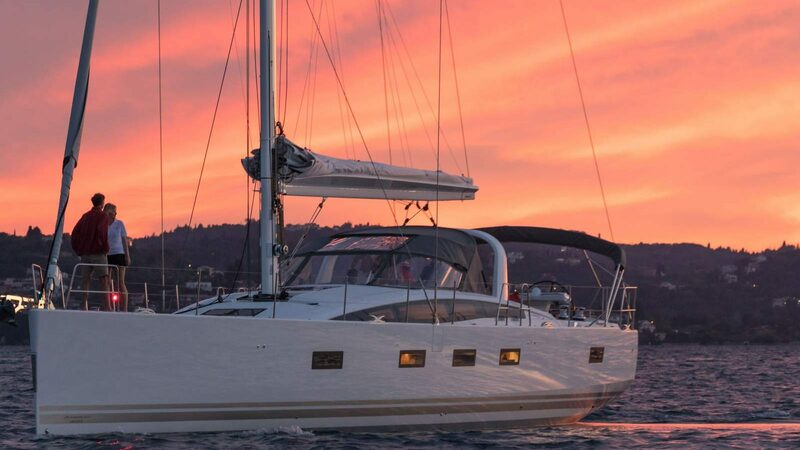 Prices shown refer to start and finish at a designated "home port" eg Corfu in the Ionian. "One-way" trips are also available at additional cost and it is a fabulous way to see more. One-ways on application - a typical one-way fee for a week's trip would be €150 per person. Dinner is optional at £25 per adult, £20 per child for 3 courses and £5 less for 2 courses. All customers must be sufficiently fit and healthy. 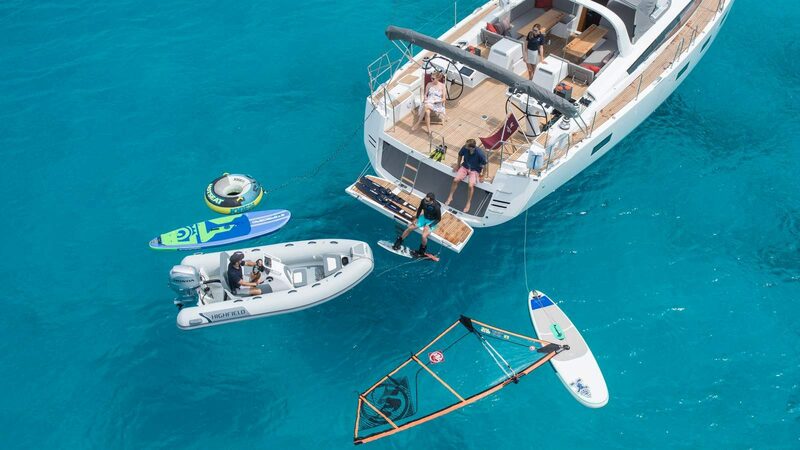 The skipper has the right to refuse boarding to any guest who he believes is not sufficiently able and may endanger themselves or other crew-members. Site designed and built by Mighty Oak Creative. All content © 2019 Lunous.